When was the last time you listened to a sporting event on the radio? If given a choice between watching the game on a big screen HD or turning on the AM radio, most of us would probably choose the visual sensation of television. But, for a moment, think about the active attention you need in order to listen to a radio broadcast and interpret the play-by-play announcer's descriptions. As you hear the words, your "mind's eye" paints the picture of the action so you can imagine the scene and situations. Your knowledge of the game, either from playing it or watching it for years helps you understand the narrative, the terms and the game's "lingo". Now, imagine that you are listening to a broadcast about a sport you know nothing about. Hearing Mr. 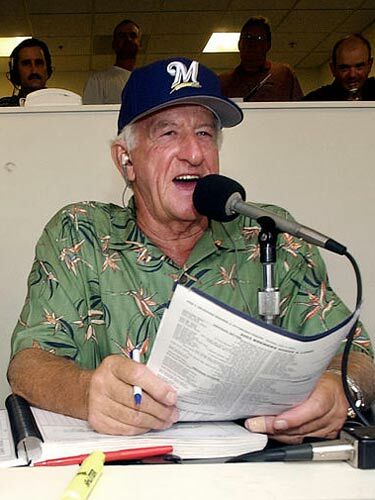 Baseball, Bob Uecker say, "With two out in the ninth, the bases are loaded and the Brewers' RBI leader has two strikes. The infield is in as the pitcher delivers. Its a hard grounder to third that he takes on the short hop and fires a bullet to first for the final out." If you have no baseball-specific knowledge, those sentences are meaningless. However, for those of us that have grown up with baseball, that description makes perfect sense and our mind's eye helped us picture the scene. That last sentence about the "hard grounder" and the thrown "bullet" may have even triggered some unconscious physical movements by you as your brain interpreted those action phrases. That sensorimotor reaction is at the base of what is called "embodied cognition". Sian Beilock, associate professor of psychology and leader of the Human Performance Lab at the University of Chicago, has defined the term this way: "In contrast to traditional views of the mind as an abstract information processor, recent work suggests that our representations of objects and events are grounded in action. That is, our knowledge is embodied, in the sense that it consists of sensorimotor information about potential interactions that objects or events may allow." In a recent study, "Sports Experience Changes the Neural Processing of Action Language", Dr. Beilock's team continued their research into the link between our learned motor skills and our language comprehension about those motor skills. Since embodied cognition connects the body with our cognition, the sports domain provides a logical domain to study it. Their initial look at this concept was in a 2006 study where the team designed an experiment to compare the knowledge representation skill of experienced hockey players and novices. Each group first read sentences describing both hockey-related action and common, "every-day" action, (i.e. "the referee saw the hockey helmet on the bench" vs. "the child saw the balloon in the air"). They were then shown pictures of the object mentioned in the sentences and were asked if the picture matched the action in the sentence they read. Both groups, the athletes and the novices, responded equally in terms of accuracy and response time to the everyday sentences and pictures, but the athletes responded significantly faster to the hockey-specific sentences and pictures. The conclusion is that those with the sensorimotor experience of sport give them an advantage of processing time over those that have not had that same experience. This may seem pretty obvious that people who have played hockey will respond faster to sentence/picture relationships about hockey than non-hockey players. But the 2006 study set the groundwork for Beilock's team to take the next step with the question, "is there any evidence that the athletes are using different parts of their brain when processing these match or no match decisions?" The link between our physical skill memory and our language comprehension would be at the base of the embodied cognition theory. So, the HPL team kept the same basic experimental design, but now wanted to watch the participants' brain activity using fMRI scanning. This time, there were three groups, hockey players, avid fans of hockey and novices who had no playing or viewing experience with hockey at all. First, all groups passively listened to sentences about hockey actions and also sentences about everyday actions while being monitored by fMRI. 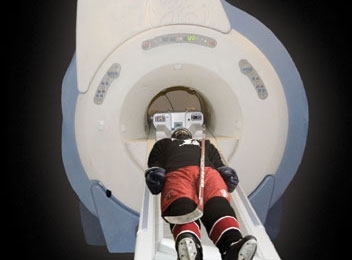 Second, outside of the fMRI scanner, they again listened to hockey-related and everyday-related action sentences and then were shown pictures of hockey or every day action and asked if there was a match or mis-match between the sentence and the picture. This comprehension test showed similar results as in 2006, but now the team could try to match the relative skill in comprehension to the neural activity shown in the fMRI scans when listening. Both the players and the fans showed increased activity in the left dorsal premotor cortex, a region thought to support the selection of well-learned action plans and procedures. You might be surprised that the fans' brains showed activity in the same regions as the athletes. We saw this effect in a previous post, "Does Practice Make Perfect", where those that practiced a new dance routine and those that only watched it showed similar brain area activity. On the other side, the total novices showed activity in the bilateral primary sensory-motor cortex, an area typically known for carrying out step by step instructions for new or novel tasks. When playing or watching, we are actually calling on additional neural networks in our brains to help our normal language comprehension abilities. In other words, the memories of learned actions are linked and assist other cognitive tasks. That sounds pretty much like the definition of embodied cognition and Dr. Beilock's research has helped that theory take another step forward. Beilock added, "Experience playing and watching sports has enduring effects on language understanding by changing the neural networks that support comprehension to incorporate areas active in performing sports skills." So, take pride in your own brain the next time you hear, "Kobe dribbles the ball to the top of the key, crosses over, drives the lane, and finger rolls over Duncan for two." If you can picture that play in your mind, your left dorsal premotor cortex just kicked into gear!